Cannabis Facilities and structures require specialized protection, security plans and services. These locations are often the target of attention for potential criminals, terrorists, and activists. Site-specific emergency response plans, business continuity strategies, security procedures, and reporting protocols are traditionally required by local, state, and federal law enforcement agencies. When it comes to providing a safe physical environment for employees, it is very important to understand how to best protect them in light of the specific physical layout of their surroundings. 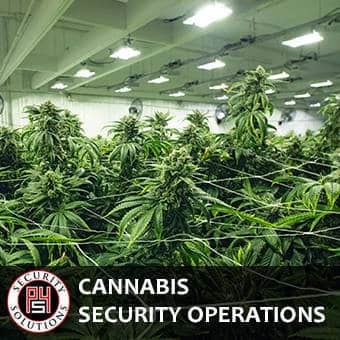 The professionals at P4 Security Solutions will work with you to evaluate any physical risk vulnerabilities with regard to your dispensaries, growing facilities, offices and parking lots. We can provide an assessment of your current security effectiveness and provide recommendations that are tailor fit to your physical surroundings. Access control strategy plays a critical role in adequately protecting not only main building entrances, but also the admit points of suites and offices. P4S will conduct a comprehensive review of your access control systems for effectiveness, potential vulnerability and overall functionality. Our evaluation will assess both the physical equipment being currently used, as well as the design implementation of the system. Not only can we provide strategies, but we can help you place guards where ever and as often as needed.